Due to a family health issue, these lectures have had to be canceled. But, we will be rescheduling for early in the New Year, so keep an eye out for details, or email me to let me know your interest and I’ll notify you when they have been rescheduled. Thank you! 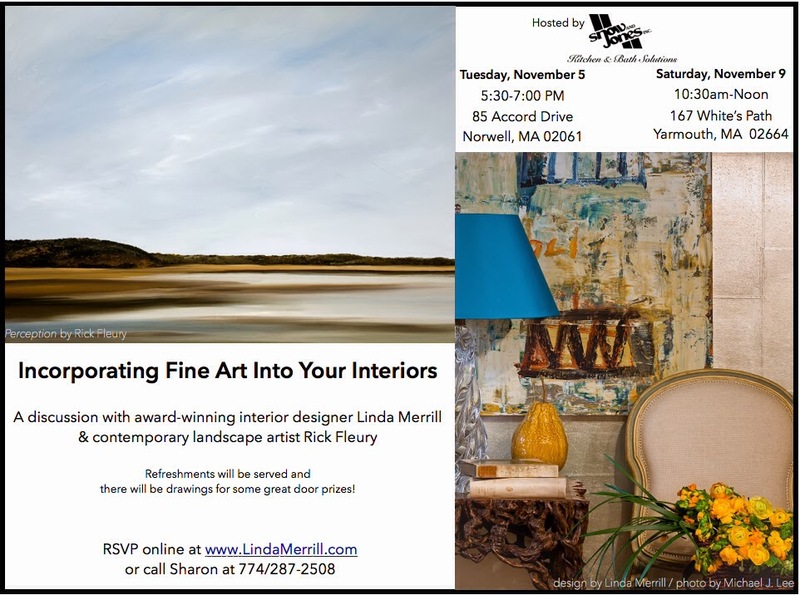 I wanted to share a quick reminder to local peeps that my lecture on incorporating fine art in interior design is coming up next week! Painter Rick Fleury and I will be sharing our thoughts on the important place that art holds in the decorative process and how it brings true life to our homes. We’ll be speaking in Norwell on Tuesday, Nov. 5th at 5:30pm and Saturday, Nov. 9th at 10:30am. We’ve been hard at work putting together our talk and we’re going to heave some great giveaways! I’ll be giving away two gift certificates for a design consultation, Rick is offering two of his fine art prints and our host Danielle at Snow & Jones will be offering a fabulous Moxie shower head by Kohler. And there will be snacks too! “Perception” by Rick Fleury with a modern, masculine design scheme. Top Design: A new gig!